Commissioned by OSLO PILOT, House of Commons is the first in a series of Art Pilots—artworks conceived and realised in public spaces across the city of Oslo. 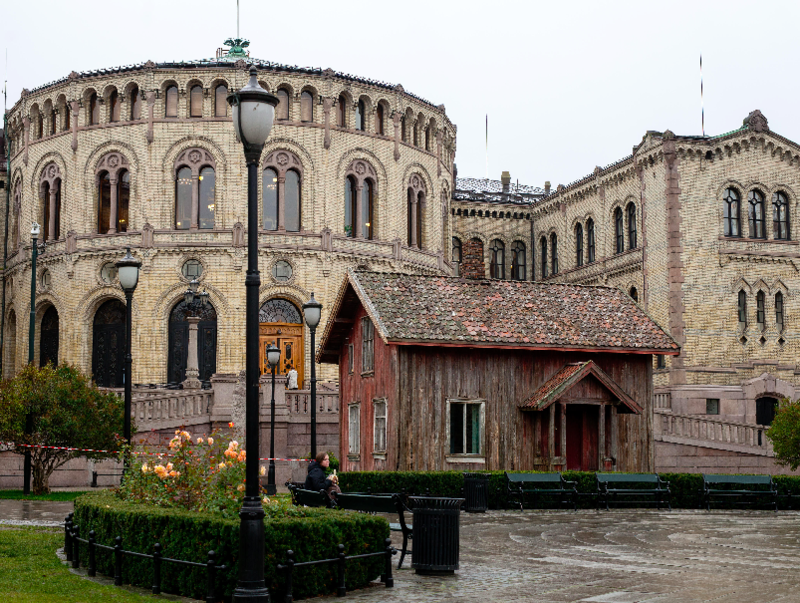 The project involves the relocation of a small abandoned provincial house from Østfold to the space in front of the Storting, the seat of Norway’s parliament in central Oslo. The small, weathered house stands at the foot of the venerable parliamentary building, which looms over it, its two outer wings embracing what was once a home to many generations. Heske is perhaps best known for the year-long project she conceived for the 1980 Paris Biennale, Project Gjerdeløa, in which a seventeenth-century log cabin was dismantled from its steep mountainside location in Tafjord, Norway, reassembled within the halls of the Pompidou, tagged by the carvings of visitors, and, upon the closing of the exhibition, returned to its original location. For this new commission, Heske revisits this act of geographical displacement, raising the stakes of the gesture by positioning it squarely in a physical and discursive national context. In claiming this highly codified outdoor space, House of Commons positions two distinct realities in direct conversation with one another: the mundane toil of rural life confronts the seat of governmental power; worn planks stand in contrast to lavish granite; the transience of life and memory are thrown into relief by the presence of the nation state and its authorised version of history. This apparently trivial juxtaposition brings out the distinction between showing and saying, creating relationships between diverging realities. The installation is a fusion of the aesthetic, the intellectual and the social. House of Commons is supported by the Norwegian Public Road Administration and KORO, Public Art Norway. OSLO PILOT is a project initiated and funded by the Agency of Cultural Affairs, City of Oslo. Marianne Heske was born in 1946 Ålesund, Norway. Emerging as one of Norway’s foremost conceptual artists in the late 1970s, Marianne Heske’s work in installation, photography, print, and video has since gained international recognition. She represented Norway at the 1986 Venice Biennale, 1996 São Paulo Biennial, and EXPO 2000 in Hanover, and her work forms part of several significant collections including the National Gallery of Norway, Malmö Museum of Modern Art, Centre Georges Pompidou, and the city collections of Paris, Shanghai, and Oslo. The relocated house was built in the mid-1800s, approximately the same time as the construction of the Norwegian Parliament. The house was inhabited until the end of 1964. Marianne Heske became familiar with the house during her travels through Elvestadkrysset in the Hobøl region of Southeast Norway. The house was unoccupied and due to be demolished by the Norwegian Road Authorities as part of the extension of the new E18 highway. The artist undertook to dismantle the house, piece by piece, and keep it in storage before it was meticulously reconstructed in front of the Parliament building. It will remain insitu from 21 October 2015 until January 2016.